Maybe this is why I keep wearing blue. This was kind of another disaster. I keep buying pink polish, because my husband likes it, but I keep having fairly yellow skin on my hands? (Not so much my face, really.) And it keeps being weird and unsuitable. I suppose it’s not helped by my not liking pink very much. This is another of my UO guilt haul polishes. Weirdly, the name fell off! So I don’t know what color this is, actually, unless I find a little round sticker lying around. (And the internet is oddly unhelpful.) 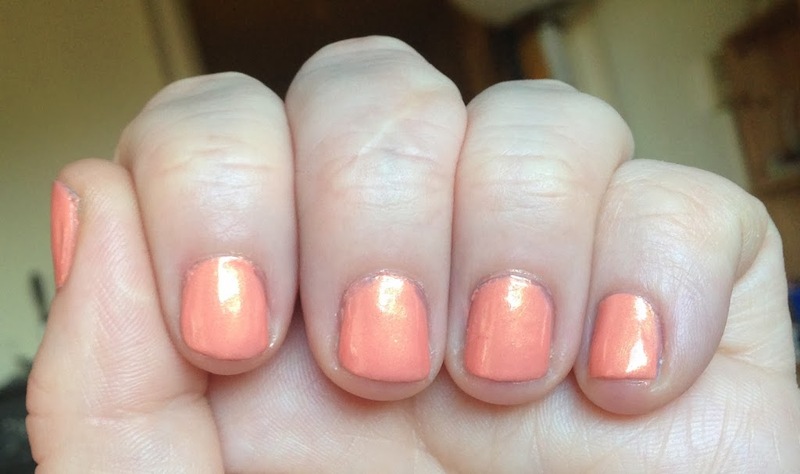 So I guess it’s my kind of coral, kind of pink, gold-shimmer-laden UO mystery polish. Indirect (but actual!) sunlight. Mostly I just take these in front of a window. And by “my” I mean “soon to belong to someone with the right skin tone for it”. When nail polish is the wrong color for someone, it always looks to me like it got sloppily photoshopped in. The application is so hilariously terrible because it’s very sheer, so I kept going to try to fix it… this must be 5 coats. I think on someone else it would go more smoothly. I think I need to use something soothing next. :-/ This made me sad. Oh, I tried putting various glitters and sfx toppers over it, but it just kept getting worse… lipstick on a pig, I guess.